NBC 6's Amanda Plasencia reports on the reaction after President Trump denied the Hurricane Maria death toll in Puerto Rico. The direct and swift rebuke from Trump's Florida allies demonstrated the significance of the Puerto Rican voters in a state. Florida was already home to more than 1 million Puerto Ricans before Hurricane Maria slammed into the island territory nearly a year ago. In just a few moments and two tweets, President Donald Trump roiled Florida's crucial elections, upending his party's ongoing efforts to make inroads to the battleground state's growing Puerto Rican population. 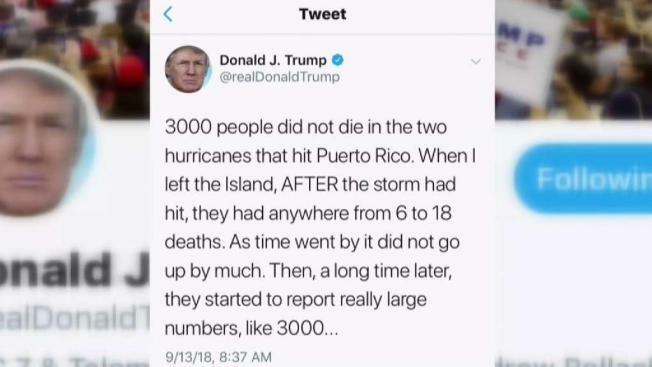 Trump's tweets Thursday claiming that "3,000 people did not die" in the hurricanes that hit the island last year and falsely alleging that the official death toll was part of a plot by Democrats to make him look bad were immediately condemned by Puerto Rican leaders, Democratic opponents and, in a rare breach, fellow Republicans in the state.